Four senior judges of the Supreme Court today mounted a virtual revolt against the chief justice, listing a litany of problems that they said are afflicting the country's highest court. 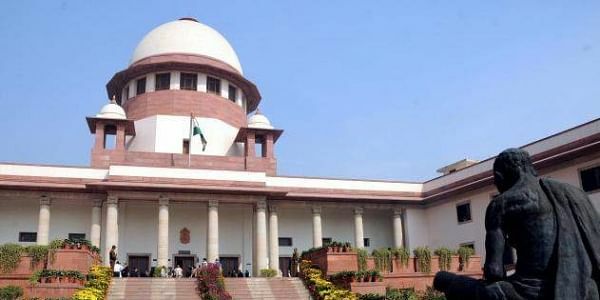 NEW DELHI: Four senior judges of the Supreme Court today mounted a virtual revolt against the chief justice, listing a litany of problems that they said are afflicting the country's highest court and warned they could destroy Indian democracy. 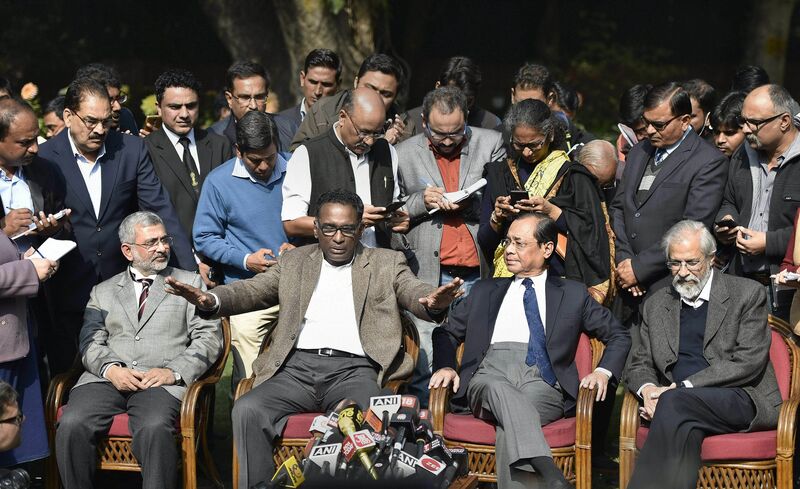 The unprecedented move at a joint news conference by the four judges including Justice J Chelameswar, the second senior judge after the Chief Justice of India, left the judiciary and observers stunned, leaving uncertain how this open dissension in the hallowed institution would be resolved. Justice Chelameswar himself described as an "extraordinary event" the news conference during which he said "sometimes administration of the Supreme Court is not in order and many things which are less than desirable have happened in the last few months." Unless this institution is preserved, "democracy will not survive" in this country, Chelameswar said in the unscheduled press conference, in the first of its kind event in independent India. In a scathing criticism and unvarnished self-reflection of the Supreme Court, Chelameswar, who was accompanied by Justices Ranjan Gogoi, M B Lokur and Kurian Joseph at the press conference, said they had met Chief Justice Dipak Misra this morning and "raised issues affecting the institution". "Unless this institution is preserved, democracy will not survive in this country," Justice Chelameswar said, adding that it was "extremly painful" to hold the press conference in such a manner. The press conference was held at Chelameswar's residence. He said all the four judges "failed to persuade CJI that certain things are not in order and therefore you should take remedial measures. Unfortunately our efforts failed. Asked what these issues were, he said they included the "allocation of cases by CJI". The remarks assume significance as the Supreme Court today took up for consideration the issue of alleged mysterious death of special CBI judge BH Loya, who was hearing the sensitive Sohrabuddin Sheikh encounter case. ALSO READ | Who are the four 'rebel' Supreme Court judges who called for protecting the judiciary? Justice Chelameswar said "we owe a responsibility to the institution and the nation. Our efforts have failed in convincing CJI to take steps to protect the institution." "This is an extraordinary event in the history of any nation, more particularly this nation and an extraordinary event in the institution of judiciary ... It is with no pleasure that we are compelled to call this press conference. But sometimes adminstration of the Supreme Court is not in order and many things which are less than desirable have happened in the last few months," he said. The four judges, in their seven-page letter to the CJI that was released to the press, said, "It is too well settled in the jurisprudence of this country that the chief justice is only first amongst the equals -- nothing more or nothing less." At the news conference, all the judges rubbished questions on whether they have broken ranks and said that they will start doing things which they do. Justice Gogoi said "nobody is breaking the rank and it is discharge of debt to nation which we have done." Gogoi, who would be succeeding Misra as CJI in October this year, said that, "it's a discharge of debt to the nation which we have done." Asked whether they wanted the Chief Justice to be impeached, Justice Chelameswar said, "let the nation decide." Soon after the press conference ended, the CJI called Attorney General KK Venugopal for a meeting, court sources said. Highly placed government sources said the issues raised by the four judges are an "internal" matter of the judiciary, indicating that the government is unlikely to interfere. However, the sources also added that the apex court should settle the issue at the earliest as the faith of the people in the judiciary is at stake. "It is a sad day for the judicial system," said Congress leader Ashwani Kumar, who is also a senior advocate.